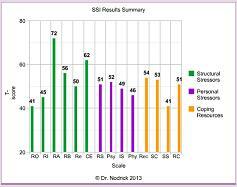 What is the Stepfamily Stress Index? b) appropriate actions could be prescribed to relieve that stepfamily's stress. It assesses fourteen different areas that are important for the effective functioning of individuals living in a stepfamily setting. c) assesses how well you are using a number of important stress-reducing skills to combat these stressors. 1) Click on the link below to start the survey. 2) Answer each of the questions as indicated. 3) When you have finished the last question, hit the “Submit” button to forward your answers for scoring. 4) Then ask your partner to (independently) complete the survey. Should my partner and I complete the SSI together? You may complete the SSI all on your own. However, if you and your partner both decide to complete the SSI, we prefer that each of you complete it independently, because the differences between your answers will help us to understand your family and circumstances much better. How long does it take to complete the SSI? Most people are able to complete the SSI within 15 to 20 minutes. Part 1 asks a few questions about the membership of your stepfamily. Part 2 looks at a number of specific stepfamily situations [60 questions]. Part 3 focuses upon the way these situations impact you [40 questions]. Part 4 examines the strategies you use in various situations [40 questions]. For each, simply select the correct answer, or the option that best fits your circumstances. All items require an answer. Please Note: The report of your SSI results will only be available from your Stepfamily Foundation of Alberta counsellor or course instructor. If you do not currently have a counsellor, or are not enrolled in one of our courses, it will be necessary to book an appointment with one of our stepfamily specialists to receive the interpretation of your SSI results. The information contained on this page is for the personal use of stepfamily members visiting the Stepfamily Foundation of Alberta web site. All other use, reproduction, distribution or storage of this work, in whole or in part, by any and all means, without the express written permission of the author, is strictly prohibited.